I remember the first time I held this skinny baby turned skinny boy. I remember how God spoke saying he is really HIS. As I reminded him of that last night, he smiled. As I reminded him he is made is for something great, he smiled. As I hugged him tight and told him how proud he makes me, he smiled. Hunter, you’ve always been a smiler. Teachers always use words like happy, polite, sweet and kind to describe you. You do such a great job putting others before yourself. You really do love your friends. I love watching you mature. Just in the last two weeks, you Sunday School teachers have commented on your leadership in class, your teacher has complimented your behavior and your heart has been broken for friends who might not know Jesus. You are memorizing Bible verses on your own, reading chapter books and you even hit your first two home runs in baseball. You are becoming a leader on and off the field in so many ways. Son, thank you for always being considerate of others. Even me. You are always so helpful to and concerned about me. You love to ride your bike. You have grown your hair out so the wind can whip through it messing it all up. You love video games and skateboards and football. You love music. You love to sing. Loud. With the radio and even without. I love to hear your voice. You are all boy. A rough player but a kind friend. All boy becoming all man. God has a special plan to use you to change the world for him, my sweet warrior-worshiper. Thank you, Jesus for Hunter! What an honor to raise him, pray for him, live life with him. Glory. 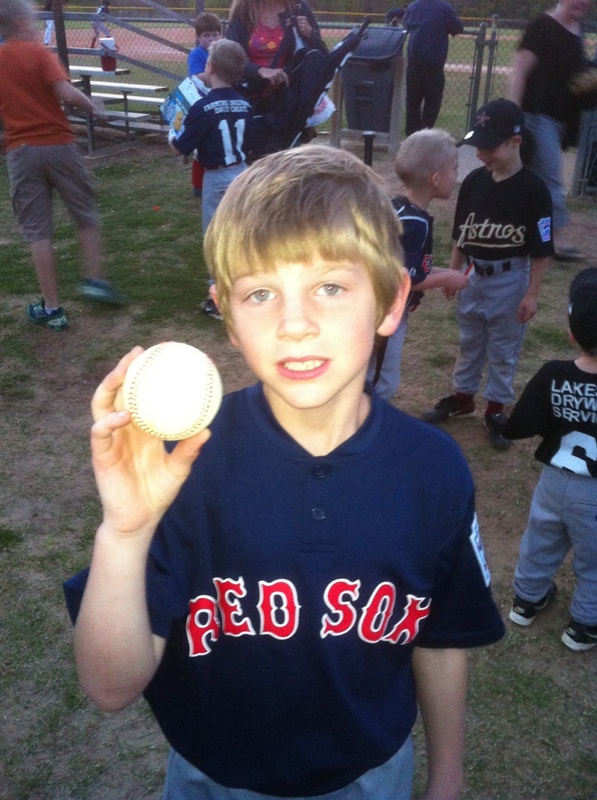 Hunter with his game ball. He really was proud. We've had quite the two week baseball run!! Palmer's game ball. Hunter earned the game ball last week! He hit his first homerun, another good hit that could've been a homer but hit the pitching machine and he was held to first and made a really great out at first base. The sad thing in all this is I missed the end of both those games. I had to run other children other places. You know it's impossible to be two places at one time! I did see Palmer's famous play but missed the game ball huddle. I had to leave Hunter's game to run a girl to volleyball practice. Anyway, I told him last night he'd just have to hit me a home run. And he did!!! It was so exciting. He had to slide into home under the catcher's glove to be safe. And he did!!! He's making a quite a name for himself. “Mom, what makes forgiving our sins as far as the east is from the west such a big deal?” my daughter asked as we were driving down the road. Being a mom for eleven years has taught me one thing. Think before you answer. I thought through my answer because that’s really, really far away, honey. And then the lameness of how close the east coast is to west coast on a map. And sent a desperate prayer up for help. My typical mom prayer: H-E-L-P!!! Thankfully, I had my previous night’s encounter with God’s grace to draw from but I wanted her (and my other three children who were listening) to understand how awesome and almost unbelievable God’s forgiveness is. Before I could start my answer, she kept talking, “I learned that north and south meet but east and west go on forever.” Now my own ears perked up because I had no earthly idea what she was talking about. But I wanted to. I did what any person in my situation would do. I called a smart teacher-type friend. There are two points where north and south meet. The North Pole and the South Pole. If you walk north, you only walk north until you reach the North Pole; then once you cross it, you begin walking south. You walk south until you reach the South Pole and then once again, you are walking north. This is not so with east and west. If you begin a journey walking east, you will never be walking west unless you turn around and go the opposite direction. That means God hasn’t just taken our sins far away from us or chosen to forget them; He has actually taken our sins to a point that doesn’t exist. God has separated us from our sins forever. The only time we are reunited with our past mistakes is when we decide to dwell there. Little girl that is why this east west type forgiveness is such a big deal. Labels: Alyssa, children, devotionals, faith, forgiveness, Mommy, why? Then the Israelites go into battle against Ai, again, armed with God’s game plan and the ambush was successful. The do-over got done right. I noticed how Joshua raced into battle in chapter 7 without hearing from the Lord. This week I realized Joshua didn’t seek the Lord because he listened to his friends. The result of the first attack on Ai, a small city, was a massacre for God’s chosen people. Their disaster brought them face to face with His love. God turned His head toward Joshua as sin was exterminated from their camp. In His great mercy, love, compassion and grace He spoke once more. And what were the first words spoken after a complete bumble? Don’t be afraid or discouraged: Sin does that. When I listen to what others say, even well meaning others, I tend to become unsure of God’s voice. I share the vision for ministry God has given me and I hear things like, “That’s not original enough,” “Are you sure people will interested in that?” “Why would you do that?” and “How will you support your family?” I become fearful of rejection and failure. I lose my passion and energy to discouragement and doubt. The result is I don’t ever remember hearing God’s voice at all. Take the entire army and go: Don’t assume victory will be easy. In college, I visited an eating disorder/overeating group. The group’s intention was for women to hold each other accountable to healthy dieting (most members were trying to lose weight) by implementing godly habits. I was crying out for help. I had started rigidly counting the number of calories I consumed each day. I was working out three or four hours daily in addition to the food restriction. I felt I was spinning out of control and wanted accountability. When I shared my story, the older women took one look at my 120-pound body and said if counting calories and over-exercising were all I was worried about, I didn’t have a problem. I became terrified the way I was feeling was normal. I doubted it had been God telling me I needed to get help and share my story. I became discouraged from seeking outside help and hesitant to share my experiences with others. The ladies at the group decided the ‘city’ I was fighting was small and wouldn’t take much for me to win victory. I battled bouts of starvation, binging and purging for the next five years and still battle the emotional wounds of an eating disorder. God knew my own Ai would take the entire army to defeat. It is now yours to conquer: The victory is already ours. The enemy would like us to believe small cities are easy to conquer. God’s Word is clear, from small cities come giant victories. And from small-city victories come world-changing visions. Don’t suffer from small city syndrome. Believe big! Palmer is playing baseball. Tee ball to be exact. My little boy in uniform is so stinkin’ cute! I love the look of little boys all in uniform as I drive into the ballpark parking lot. I love the excitement of a close game. I really love watching my kids succeed. I am learning to appreciate the process that takes them there. To success. Palmer’s first-ever at the plate experience, his bat made contact with the ball. Contact resulted in the ball dropping off the tee and rolling about ten inches toward the pitcher’s mound. He turned around still holding the bat and shrugged at his dad. With Daddy, Mommy, siblings, coaches and crowd yelling, he made it first base. Safe! Last night he had his second at bat experience. He knocked the ball off the tee and it flew to the pitcher’s mound. He quickly ran to first base as the pitcher threw the ball. Safe! I reveled in his progress. The next batter steps up to the plate and hits the ball way out into center field. The coach starts wildly shouting at the boys to run. The batter runs—right past Palmer—all the way to third base. At which point, the second baseman recovers the ball. The batter who is now ‘safe’ on third base and also shouting at Palmer, runs back to second. He is now just inches away from the second baseman holding the ball. He continues back to first base where he is miraculously safe on first base. After hitting a triple. All the while, Palmer has his foot firmly and ‘safely’ planted on second base. Even with every person in the stadium shouting Palmer’s name, he has no idea he is supposed to run. Hilarious? Yes. Catastrophic? Possibly. The next time Palmer gets up to bat, he hits the ball and runs safely to first. Then he promptly takes second and third with the next batter’s hit. 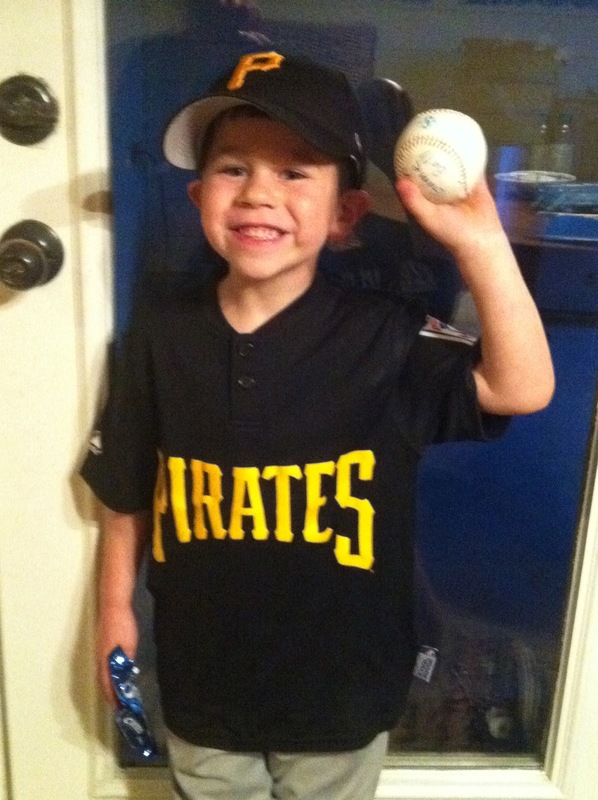 At the end of the game, Palmer’s wise coach gave him the game ball. This generous act brought tears to my eyes and joy to my heart. Palmer was graciously rewarded simply for being part of a team, learning from a mistake and successfully completing a do-over. 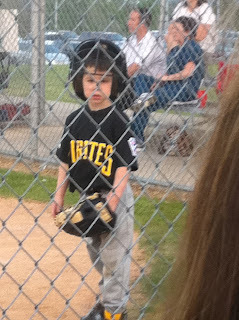 As a result, my little boy who thought practice was boring is now anxious to get out on the field. Yesterday my boy thought a jersey and cleats were the coolest things about baseball season. Today he packed a baseball with his name on it for show and tell. Yesterday he argued when I tried to put his legs in the long, itchy, yellow socks. This morning he asked me to go get the ‘lello’ socks out of the car and put them on his dresser. Palmer’s dresser has always been a spot for his precious treasure. This shrine has been home to a teddy bear from Gramma, birthday dollars, flashlights, remote control cars, noisy toy guns and any other cool, boy-pocket loot. Last night before bed it boasted a baseball uniform complete with yellow socks, a game ball and a 'borrowed' trophy and photo from Hunter’s baseball days. The mistake at second base had potential to steal the full baseball experience from a young boy. Instead, a wise coach used it to foster what has the possibility to become a lifelong love. God showed me a beautiful picture through Coach Dave last night. I’ll share it with you later. Today I’m bragging about my boy. I'm linking up at Connection Cafe today. Tyndale giveaways rock because they always give away a ton of Bibles!! I love it!! I just got this email so go get all clicky and win something. Come tell me which book you want and if you win, come back later and let me know. In honor of Tyndale launching its new book club enewsletter they’re running a 30 day giveaway on our website. The Book Club Hub Newsletter will be an email newsletter geared towards people who are in or are running book clubs. (Which I know a lot of you are.) It will feature suggestions, discussion guides and great ideas for your book clubs. You can see a preview byclicking here. Mama Bear came out at the ballpark the other night y’all. 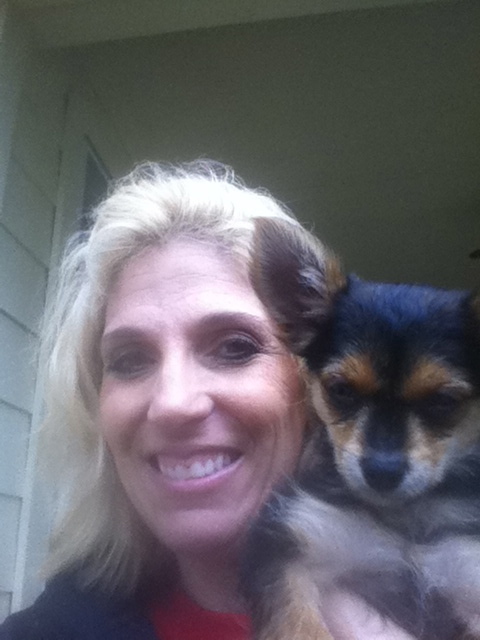 The Nazi, I mean team mom told me I couldn’t have my baby, I mean puppy there. I told her I was leaving in ten minutes to pick up my daughter. She told me I needed to take him to the car now. First of all, I was going to watch my son play as much baseball as possible before I left. Secondly, I wasn’t going to put the dog down or let him make a mess. Thirdly, there was no way I was going to allow him to chew up or stink up my car. I stewed and fumed. My mind educated team mom on how to compose a polite yet unoffensive email to the team the day following the incident in question. As I climbed into the silence of my car, I started to feel guilty. I replayed the scenario. Words I could have said. Words I should have said. Words I wished I’d have said. Anger. Guilt. Shame. Panic. I should've apologized. 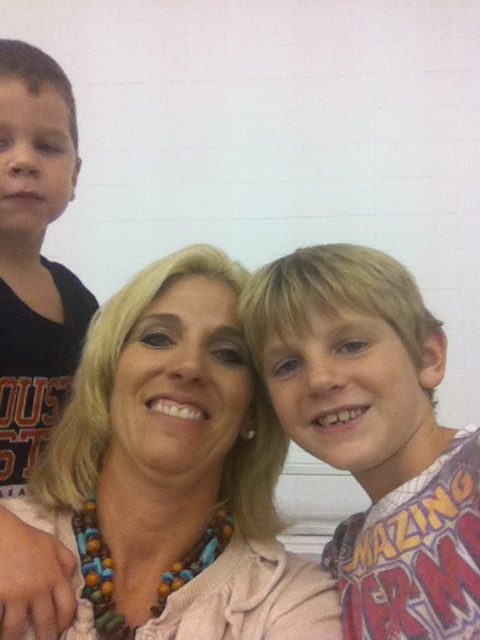 What if my son began receiving poor treatment because of his psycho mom? Suddenly I heard words. God’s words. I made a decision right there chugging down Highway 149 in the silent but smelly Suburban. I would stop replaying the conversation, stop beating myself up for blowing it and pray. As I humbly asked God for forgiveness, I received His cleansing. I rejected the thoughts of failure, guilt and shame that tried to tell me what a loser mom I am. I decided I would apologize to the mom next time I saw her. I didn’t burn my phone up searching for her mobile number, email, facebook or twitter accounts. I pushed the stress away when I realized we would miss the very next practice due to spring break. And last night, I apologized. And she forgave me. But it was so after the fact because I have been living forgiven already for weeks. Maybe one day we’ll laugh about it together. Or maybe we won’t. But deciding to separate myself from my sin is a choice that is transforming me and will transform me as I get better at it. That instant, the instant I decided to receive forgiveness and grace and put the whole thing out of my mind, I was reminded of this word. How have you embraced grace recently? In the following days I'll share with you what my daughter taught me about east and west forgiveness and what Amber taught me about spiritual gifts. See you back here! Practicing truth gives life to my soul. As a little girl I developed a horrible habit of replaying my entire day before I went to sleep at night. I had each conversation again and again until I got my response exactly right. I took up for myself in fights, had witty comebacks in the popular social circles and wore matching socks with my brown leather knee high boots. In my mind, these perfect responses eased stress. In actuality, the reruns stole my peace and ability to sleep. My own thoughts took life from me. It wasn’t until I became a sleep-deprived mommy that I could lay my head on the pillow and fall into immediate slumber. While I don’t have the time or energy to replay each day’s scenes at night, I noticed a few weeks ago my tendency to dwell on the faulty ones. Two weeks ago I made the choice to focus on the day’s successes instead of the failures. One day last week, it was praising God the children cooperated and carried the giant baskets of laundry upstairs. That was it. We did other not-as-successful activities but that day we did that one perfectly. Last night, I went to bed praising God for the mess in my kitchen my daughter made baking her own cake. A yes to cake baking allowed a really special conversation before bed last night. Saying no to the dishes in the sink gave me time to sit on the deck and enjoy the perfect weather with my husband. Lingering at bedtime provided divine moments of prayer. Putting off my list gave a little girl the cuddle time she desires. My fingers ache to check off the last item on my list before I say goodbye to another day. Sometimes my fingers ache to just cross off one item. But if I find myself treating my loved ones as interruptions to my to do list instead of the other way around, I find myself replaying failures as I seek rest. If I put off my list for another day and spend my time loving others, sweet sleep, refreshment and peace come naturally. I’m learning to practice truth by encouraging success to grow in my soul. My life depends on it. I'll share with you the big moment I recognized this bad habit and the embarrassing situation that led to it later this week. First I want to hear from you. How will you celebrate your successes today? Backpacking through Joshua today with Amber. We have just given a sweet new puppy a loving home. Rocket is bringing us all joy and fun and giggles. Puppies bring giggles. We love our Rocky. 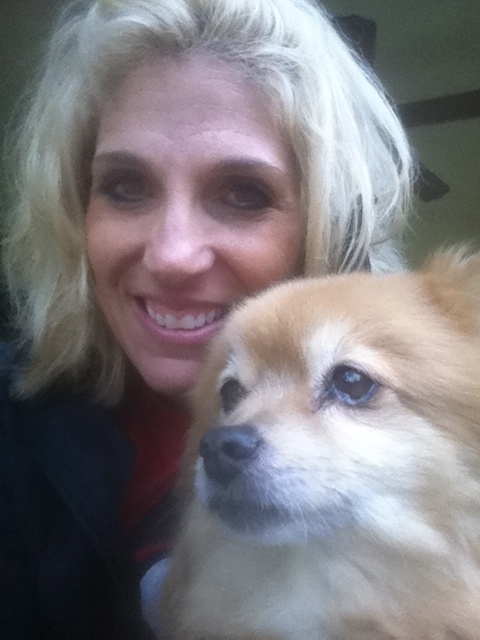 During the ten-minute discussion over a new dog, I voiced my only two conditions: small dog and forever kennel. You see, I have puppy experience. Rocky’s big sister, Foxy has a kennel. It is the one Rocky now uses. We let Foxy quit using her kennel after a few months because she was house broken. Tiny teeth promptly chewed my new couch. We've had other puppies too. I even returned one puppy to the breeder when she chewed my kitchen floor. I was so relieved to be rid of the burden, I didn’t even ask for my money back. True story! I said never again. But I relented. Because of the kids. And Rocky’s sweet face. That same sweet is not enough to worm his way out of his kennel because that little three-pound fur ball is capable of making big messes. Or at least surprise messes. Waking up in the morning to smelly dog isn’t very fun. But neither is putting Rocky in the kennel later in the day only to discover a big stinky. Or getting down on your knees and getting up with yucky nastoid on your knee. True story. The stench can be overwhelming. And that was my daughter's knee. That’s why I can’t let Rocky out of his kennel. Rocky is slowly getting house broken. He has learned not to potty in his kennel most days. Sleeping in his kennel is training him to act like a big dog. But sometimes he still has accidents in his kennel. Even though he knows he doesn’t like it. Then he has to wait for me to come, clean up his mess and wash his little body. The other day, I realized how much like Rocky I am. God gives me boundaries, instructing me how to live. He tells me not to cross certain lines. I know I won’t like it when I do. I try to worm my way out of the rules all.the.time. because I don’t like feeling stifled. I justify my behaviors, tweak God’s rules to fit my desire and sometimes mess up and have to sit around in my stink waiting for God to rescue me. God gave Joshua instructions. The Israelites obeyed Joshua and followed the rules. For awhile. Then one man got a bit stifled. He decided to keep some stuff that was going to be thrown away anyway. It was just trash. Really good, pretty trash. He decided to sit on it in his little tent. It started to stink. It wasn't long before everyone smelled it. A small infraction hidden. A little trash buried under a tent caused a big stink. It affected the whole camp. An army was defeated. Men died. All because of a little stinky. I saw the cutest brown sandals at the mall a few weeks ago! Since then the main thought taking residence in my mind is whether or not they might be on sale. And when the sale is occurring and I happen to be there will they still have my size. Seriously, important thoughts occupying my mind. All.the.time. Because I'm not shallow or anything. Recently I heard an idol defined as anything I can't stop thinking about. Today I'm linking here with Tiffini for Words for Women Wednesday. Enjoy! Have you ever stood in the endzone doing the victory dance? You’ve fought a tough battle but victory is yours. The match is over—until it isn’t. I just had one of those days. I subscribed to the ‘strength in numbers’ theory. I reasoned that victory was sure since I had so many days of victory under my belt. I even saw the sideswipe coming. I just didn’t expect it to take me out of the game! Oh I got right back up after the tackle but it was a hard hit that left me seeing cross-eyed for a bit. The best way to get back in the game is to remember the game plan. I have several verses I use as ammunition when I need to remember Whose team I’m on and how to win the game. What do you use as your favorite ammunition? Let's encourage each other today! Almost two years ago, I started running after a bit years of a hiatus. I quit running when I got pregnant with baby number two. I started again when baby number four turned three. Even through cancer, I ran when I was able. It was hard but I still ran. When I was able. In December, I ran a half marathon. It was hard. Through the cancer, I didn't run so regularly. I mean, who could blame me? The thing is when it got hard and time got tight and I didn't feel like it, I just didn't. I didn't put my shoes on, I didn't break a sweat and I didn't pound the pavement (or the treadmill) in the nasty winter months. So the half was hard. It took a long time to recover. I didn't want to start running again. Ever. But my oncologist told me I needed to. So I hired a trainer. I paid him. He tortured encouraged me. I've been on the treadmill 30 minutes, five days each week for the last six weeks. The weather turned spring and I remembered this. I wrote it almost two years ago when I started running. There's just something about spring. The sun. The sights. The shadows. The smells. I'm truly thankful I get to run today. Outside. It's a little gray but it's spring! And I really need some clarity so I'm lacing up my shoes! Last night I was reminded why I used to run. Why I loved it with all my heart at one time in my life. I began running regularly when life was cra-zy. I had an extremely stressful job with minimal support. I was overwhelmed each day to the point of paralysis. I started suffering from migraines. I became depressed. Exhaustion claimed my weekends and responsibility weighed me down really, really low. Tears were my best friends. All forty jillion of them. I began to run each afternoon. After a few short weeks I was running for an hour each day. Sixty minutes carved out of my day where no stress could touch me. No conflict could pull at my emotions. Failure was trailing somewhere far behind me on my well-beaten path. Sixty minutes gave me the strength I needed to stay in that hard place as long as I did. Sixty minutes of silence gave me the focus I needed to hear the spoken word that clarifies the written. Sixty minutes of nothingness inside my head brought positiveness to the surface. Sixty minutes was all it took to prioritize. Shoving the junk aside for what is really and truly important. Last night all it took was twenty minutes. What is happening in that twenty minutes is nothing short of miraculous. I'm not talking about me running without stopping. Although that is miraculous. What happens is in the silence, I disappear. I cease to be me. My life fades. My problems fade. My requests fade. My responsibilities fade. I have no other reason to be but for the glory of your name, Lord. I run for your name and renown. Save me, help me, make me successful for your name's sake. To give you glory. Because of who you are. For your name. In the silence it becomes clear. Crystal. This week Lysa TerKeurst is hosting a scholarship contest where she will give away two Cecil Murphey scholarships for the She Speaks conference. If you desire to communicate God's Word with excellence and reach hurting people for Christ, this is a conference you won't want to miss! She Speaks offers a variety of training classes. Both experienced and novice writers, speakers and ministry leaders can benefit at She Speaks. Visit the She Speaks website for a description of classes. Watching The Bucket List with Jack Nicholson and Morgan Freeman, I ache to experience living large before I die. In the movie two terminally ill cancer patients make a list of all the things they want to do before they kick the bucket. Then they sneak off to live out their wildest dreams. With a cancer diagnosis comes an instant desire to fully live. There is no more hem hawing around the dance of life. Even wallflower cancer patients can be found doing the Cha Cha Slide. Imagine the giant dreams I have after attending last year’s She Speaks conference and transitioning from cancer patient to survivor just a few months later! Cancer survivors inherit more than the courage to start marking experiences off their bucket lists; they earn the privilege of paying vast medical bills. I write a check each month for the amount of the She Speaks conference. I try to write the check with gratitude. Five hundred dollars is a small price for life. Praises flow as I write the first twelve checks. The hospital has a plan to pay for lifesaving cancer surgery in twelve monthly installments. I reason I will get accustomed to writing a $500 check each month and I will just extend my monthly program to cover She Speaks this year. Month thirteen arrives. She Speaks registration opens. Time to write check thirteen. Check thirteen is the check paying for endless tests, scans, doctor visits, treatments and other parts of the surgery. Check thirteen is supposed to read, “Pay to the order of She Speaks.” Check thirteen is just the first of many more checks to the cancer hospital. While my bucket list does not include skydiving and race car driving like Edward and Carter’s, making God famous by sharing my story is the desire of my heart. Writing a book and speaking to large groups of women sit right at the top of my own list. As a journalism major and former teacher, communicating with words both written and spoken pulls me naturally. Allowing God to use my story is a passion God gave me in college. Possessing courage to act on it is still being slowly birthed in me almost twenty years later. The camaraderie, encouragement and training She Speaks offers spurs me on toward my goals while drawing me closer to Jesus. Cancer is giving me a second chance to follow my lifelong dream and fully embrace my calling. She Speaks will provide the training to do so with excellence. Every day I thank God for the high price He paid for me. I want nothing more than to spend the rest of my days honoring God and making His name famous by sharing my story. Just the thought of it makes me want to break out in the Cha Cha Slide! I realized the error of my ways and that I was not mature enough to play in a big yard. I needed close boundaries to tie me to God’s Word, His life and His best. On my own, I had made a giant train wreck of my life. I knew it could be better but only if I learned God’s principles for living a pure life. I could not be trusted. I had accountability from roommates, Bible study leaders, girlfriends and mother figures. I was on fire for the Lord and nothing could stop me. Especially since I had eyes watching. I graduated from college, lived by myself and eventually got married. I quickly learned that having a husband isn’t always the same as having an accountability partner. We have rocked some areas but bombed in others. Together. I was reminded of my short leash prayer this week when reading in New York Times bestseller Made to Crave by Lysa TerKeurst. In the book, she talks about reaching her goal weight and the blessing and the curse found therein. The blessing is obvious. Her skinny jeans slide on effortlessly, she is healthy and her self discipline brings dependence on Jesus. The curse is that she, in her deprived state, wants to taste all she’s given up for the past weeks. And sometimes, just a taste is just too much. I lived on my own after college. For part of that time I didn’t have a television. When I got one, I watched it. Lots. Then I got a roommate. I didn’t watch television that much unless I was watching something with friends. Then I got married. My husband likes electronics. We had televisions! I was able to watch what I wanted when I wanted. So I did. And before I knew it, I had shows and a watching schedule and habits. A few years ago, God convicted me that I was watching too much. I realized I could do more work without the TV and I would read my Bible at night when I wasn’t distracted by it. So, after some lots of nudging from God, I quit recording my shows and kept the TV off unless I was spending time with my family watching what they chose. Then I got cancer. I got tired. When I was going through radiation, I was so tired that I didn’t feel like doing anything. I got too sore to sleep. I watched lots of TV. For the past nine months, I have been turning on the television more and more. God has been calling me away with Him. I decided for Lent, I will go. No more stealing away to see my latest episodes. No more falling asleep to the drone of CSI. And more than looking forward to Lent ending so I can turn on the TV again, I look forward to becoming closer to Christ, my One and Only. I’m hoping I don’t turn the television on at all after Lent. My short leash keeps me in a beneficial place. Last week while running, I nearly stumbled over a funny looking dog. Prancing or rather strutting in an almost masculine way, the dog's flat face and turned up nose led me to his smirk. The dog was smiling; although, clearly, dog's don't smile as humans. Then my eyes followed the leash to its other end where this lady was prancing or rather strutting in an attempt to walk her dog. Her flat face and turned up nose led me right to her smile which didn't change all that much when I smiled and said, "Hi." This lady looked just like her dog! I would have bent over laughing if it hadn't been the end of my run. I was already panting and gasping for breath. Good cover! What if I was as devoted to my Master as man's best friend? God's Word says, "But friends, that's exactly who we are: children of God. And that's only the beginning. Who knows how we'll end up! What we know is that when Christ is openly revealed, we'll see him—and in seeing him, become like him." 1 John 3:2 Isn't that good news, friends? I can become like Christ simply by spending time with Him, gazing at Him. Now, pardon the picture quality but which pet am I? Glancing at the title of Friday’s post, I thought, “Yes, I’m in a rut.” The question it asks is: R U T.i.r.e.d.? But I see rut. Tired finds me in a rut. Depression from walking the same worn path day after day after day settles over me. When I find myself in this place where I put one foot in front of the other because that’s what I’ve always done, I am neglecting certain things while diligently nurturing others. I dismiss my rut telling everyone I've found a groove. You know the place. You get so much done, you can't stop or slow down for interruptions. No matter who they might be! My groove usually produces vast outer results but leaves an inner disharmony that leads to a giant crash. My house implodes, my family feels needy and neglected and I ignore it all trying to dig myself out of the rut I've created in our road. I am holding my home together but not cradling it. I am barking orders at my household but not enjoying them. I am chauffeuring everyone where they need to go but resenting the ride. I am ignoring my soul and certainly not nourishing it. I am putting God on the back burner instead of fixing a cup of tea in the midst of the chaos. My times of devotion become checking a quiet time off a list rather than an intimate conversation between two close friends and lovers. As my rut gets deeper and deeper, with well-worn grooves, God gently woos me off the well-beaten path to come sit awhile. I usually rock my tired at around 11:00 at night. Dishes washed, kids tucked in, it’s finally time to relax. When the light hasn’t been sucked out of my eyes, I read. Lately, I veg. When I get my tired on, I fall into bed with my TV on until the melatonin kicks in. But God is challenging me. I like to spend time with God in the morning. When I’m awake, eager and alert. I like to study, pray and write. I have a routine. I like it. But lately I’ve been asking God why I can’t seem to hear Him very well. Could I be in a rut? Could I have such a groove going that I’m rushing this precious time unintentionally? Could I be operating more out of habit than love? Or maybe God just wants to teach me how choose Him instead of the vegetative state when I’m at the end of me and starting to rock my tired. I won’t forgo my morning time. I need it for my day. The Word provides fuel to help me go for long hours, new mercies each day for the mini crises that fill my world. But when I’m weary and can’t string two words together, least bit anything nice, will I go to Him for more? Even before I sleep? I know the principles. When I am weak, He is strong. Draw near to God and He will draw near to you. Seek and you will find. The end of me is the beginning of Him. He’s inviting me to open a new gift. Practicing reaching out to Him when I’m done. Done with carpool. Done with homework. Done with dinner. Done with a day. D.o.n.e. Done. The words to Norah Jones’ song have always wooed me. Come away with me in the night. My answer is yes, Lord, yes. Uploaded by Mdkart. - See the latest featured music videos.